Other factors such as insulin resistance and inflammation may be pathogenic, and levels of C-Reactive protein, E-selectin, myeloperoxidase, and metalloproteinases, are biomarkers for hypercholesterolemia and atherosclerosis and may be pathogenic as well. Vegetarians, and most especially vegans, have a much lower risk of hypercholesterolemia (for both total cholesterol and LDL) and a less atherogenic profile. A plant-based diet has been shown to be a safe and efficacious prophylaxis and therapy. Here we report on a selection of studies of particular interest to those wishing to use vegetarian nutritional medicine either as a monotherapy or as an adjunct to other therapies. 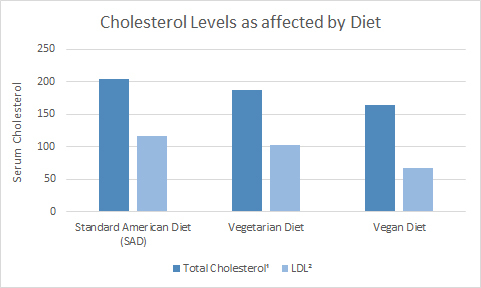 Vegetarians and vegans have lower total and LDL cholesterol levels on average. The following chart shows the average cholesterol levels on among three dietary groups. (1, 2) Vegans, or total vegetarians, have the lowest levels. In this study vegetarians were characterized by a significantly lower cE-selectin levels. Vegetarians also showed a tendency towards lower cICAM-1 levels in comparison with control subjects. (24) Low cE-selectin levels of vegetarians may reflect the favorable cardiovascular risk profile of this group. Vegetarian and vegan diets can be very efficacious in reducing serum cholesterol. One study showed that a low fat vegetarian diet was as effective as the Standard Heart Association diet plus Lovostatin. (29) This study is notable because it contains nuts in the treatment regimen. The research has been accumulating on the value of nuts in the prevention and treatment of a variety of diseases, including cardiovascular, indicating that the low-fat regimen now more commonly employed may be enhanced by moderate amounts of tree nuts. Hypercholesterolemia and atherosclerosis are perhaps the most important diseases for the physician to address given the human and the financial impact of cardiovascular disease. Epidemiological research points to the lower risk vegetarians and vegans have of both hypercholesterolemia and atherosclerosis. Since studies correct for other lifestyle factors, one is left with their diet as the determinative prophylactic factor. Research-based evidence indicates, therefore, for the efficacy and the safety of the plant-based diet for the prevention of hypercholesterolemia and atherosclerosis. Investigations into the pathophysiology of hypercholesterolemia and atherosclerosis have demonstrated that vegetarians have a profile that is less atherogenic, and sheds light on the mechanism by which this is achieved. Interventional studies point to the safety and efficacy and, indeed, the superiority of plant-based diets over pharmacotherapy for the treatment of hypercholesterolemia and atherosclerosis in many cases. The prevention and treatment of hypercholesterolemia with a plant based diet would seem to be both safe and efficacious. It has no contraindications, adverse effects and reduces the risk of common comorbidities. Finally, research is increasingly elucidating the prophylactic factors for the lower risk of these diseases experienced by vegetarians and vegans, as well as the pathogenic factors and mechanisms for the higher risk experienced by omnivores. Another, much more detailed, post covers coronary heart disease, and forthcoming posts will address ischemic stroke and essential hypertension, all of which have hypercholesterolemia and atherosclerosis as etiologic factors. 1. Thorogood M, Carter R, Benfield L, et.al. Plasma and lipoprotein cholesterol concentrations in people with different diets in Britain. British Medical Journal (Clin Res Ed). Aug 1987;295(6594):351–353. 2. Haddad E, Berk LKJ, et.al. Dietary intake and biochemical, hematologic, and immune status of vegans compared with nonvegetarians. American Journal of Clinical Nutrition. Sep 1999;70(3 Suppl):586S-593S. 3. Castelli W, Abbott R, McNamara P. Summary Estimates of Cholesterol used to predict Coronary Heart Disease. Circulation. Apr 1983;67(4):730-4. 4. Barnard N, Cohen J, Jenkins D, et.al. A low-fat vegan diet improves glycemic control and cardiovascular risk factors in a randomized clinical trial in individuals with type 2 diabetes. Diabetes Care. Aug 2006;29(8):1777-83. 5. Tobin K, Ulven S, Schuster G, et.al. 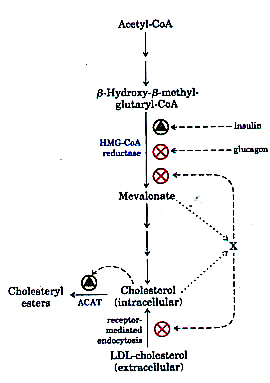 Liver X Receptors as Insulin-mediating Factors in Fatty Acid and Cholesterol Biosynthesis. Journal of Biological Chemistry. Mar 2002;277(12):10691-7. 6. Berliner J, Navab M, Fogelman A, et.al. Atherosclerosis: basic mechanisms. Oxidation, inflammation, and genetics. Circulation. May 1995;91(9):2488-96. 7. Li D, Mehta J. Oxidized LDL, a critical factor in atherogenesis. Cardiovascular Research. Dec 2005;68(3):353-4. 8. Lu S, Wu W, Lee C, et.al. LDL of Taiwanese vegetarians are less oxidizable than those of omnivores. Journal of Nutrition. Jun 2000;130(6):1591-6. 9. Vinagre J, Vinagre C, Pozzi F, et.al. Metabolism of triglyceride-rich lipoproteins and transfer of lipids to high-density lipoproteins (HDL) in vegan and omnivore subjects. Nutrition, Metabolism and Cardiovascular Diseases. Jan 2013;23(1):61-7. 10. Krajcovicova-Kudlackova M, Blazicek P. C-reactive protein and nutrition. Bratislavske Lekarske Listy. 2005;106(11):345-7. 11. Chen C, Lin Y, Lin T, et.al. Total cardiovascular risk profile of Taiwanese vegetarians. European Journal of Clinical Nutrition. Jan 2008;62(1):138-44. 12. Upadhyay R. Emerging Risk Biomarkers in Cardiovascular Diseases and Disorders. Journal of Lipids. 2015;2015:Article ID 971453, 50 pages. 13. Papazafiropoulou A, Tentolouris N. Matrix metalloproteinases and cardiovascular diseases. Hippokratia. Apr-Jun 2009;13(2):76-82. 14. Stary H, Chandler A, Dinsmore R, et.al. A definition of advanced types of atherosclerotic lesions and a histological classification of atherosclerosis. A report from the Committee on Vascular Lesions of the Council on Arteriosclerosis, American Heart Association. Circulation. Sep 1995;92(5):1355-74. 15. Brown D, Hibbs M, Kearney M, Isner J. Differential expression of 92-kDa gelatinase in primary atherosclerotic versus restenotic coronary lesions. American Journal of Cardiology. Apr 1997;79(7):878-82. 16. Brown D, Hibbs M, Kearney M, et.al. Identification of 92-kD gelatinase in human coronary atherosclerotic lesions: association of active enzyme synthesis with unstable angina. Circulation. Apr 1995;91(8):2125-31. 17. Blankenberg S, Rupprecht H, Poirier O, et.al. Plasma concentrations and genetic variation of matrix metalloproteinase 9 and prognosis of patients with cardiovascular disease. Circulation. Apr 2003;107(12):1579-85. 18. Orbe J, Fernandez L, Rodríguez J, et.al. Different expression of MMPs/TIMP-1 in human atherosclerotic lesions. Relation to plaque features and vascular bed. Atherosclerosis. Oct 2003;170(2):269-76. 19. Noji Y, Kajinami K, Kawashiri M, et.al. Circulating matrix metalloproteinases and their inhibitors in premature coronary atherosclerosis. Clinical Chemistry and Laboratory Medicine. May 2001;39(5):380-4. 20. Beaudeux J, Giral P, Bruckert E, et.al. Serum matrix metalloproteinase-3 and tissue inhibitor of metalloproteinases-1 as potential markers of carotid atherosclerosis in infraclinical hyperlipidemia. Atherosclerosis. Jul 2003;169(1):139-46. 21. Navarro J, de Gouveia L, Rocha-Penha L, et.al. Reduced levels of potential circulating biomarkers of cardiovascular diseases in apparently healthy vegetarian men. Clinica Chimica Acta. Aug 2016;461:110-113. 22. Leeuwenberg J, Smeets E, Neefjes J, et.al. E-selectin and intercellular adhesion molecule-1 are released by activated human endothelial cells in vitro. Immunology. Dec 1992;77(4):543-9. 23. van de Stolpe A, van der Saag P. Intercellular adhesion molecule-1. Journal of Molecular Medicine (Berlin). Jan 1996;74(1):13-33. 24. Purschwitz K, Rassoul F, Reuter W, et.al. [Soluble leukocyte adhesion molecules in vegetarians of various ages]. Zeitschrift fur Gerontologie und Geriatrie. Dec 2001;34(6):476-9. 25. Glick-Bauer M, Yeh MC. The Health Advantage of a Vegan Diet: Exploring the Gut Microbiota Connection. Nutrients. Oct 2014;6(11):4822-38. 26. Ussher J, Lopaschuk G, Arduini A. Gut microbiota metabolism of l-carnitine and cardiovascular risk. Atherosclerosis. Dec 2013;231(2):456-61. 27. Koeth R, Wang Z, Levison B, et.al. Intestinal microbiota metabolism of L-carnitine, a nutrient in red meat, promotes atherosclerosis. Nature Medicine. May 2013;19(5):576-585. 28. Miller C, Corbin K, da Costa K, et.al. Effect of egg ingestion on trimethylamine-N-oxide production in humans: a randomized, controlled, dose-response study. American Journal of Clinical Nutrition. Sep 2014;100(3):778–786. 29. Jenkins D, Kendall C, Marchie A, et.al. Direct comparison of a dietary portfolio of cholesterol-lowering foods with a statin in hypercholesterolemic participants. American Journal of Clinical Nutrition. Feb 2005;81(2):380-7. 30. Macknin M, Kong T, Weier A, et.al. Plant-Based, No-Added-Fat or American Heart Association Diets: Impact on Cardiovascular Risk in Obese Children with Hypercholesterolemia and Their Parents. Journal of Pediatrics. Apr 2015;166(4):953-9. This entry was posted in Cardiology, Internal Medicine and tagged atherogenic, atherosclerosis, C-reactive protein, cholesterol, cholesterol ratio, hypercholesterolemia, insulin sensitivity, l-carnitine, LDL oxidation, microbiota, TMAO, vegan diet, vegetarian. Bookmark the permalink.